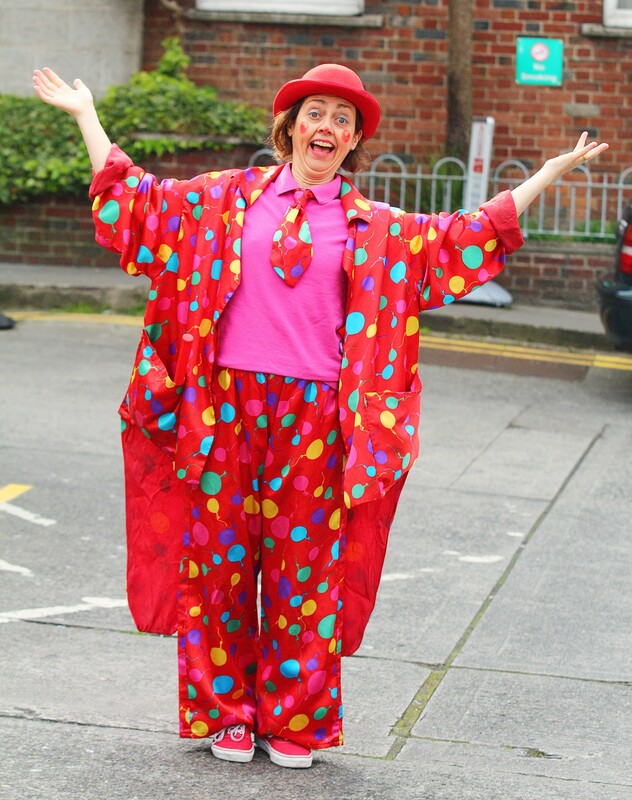 Brid Ni Chionaola is Silly Sally The Clown. Brid has studied physical theatre in Paris and has an MA in Drama. She has almost 20 years experience entertaining children and can do magic, walkabout clown, balloon modelling and games, facepainting and glitter hairspray and makeup. With their combination of all these elements, there is something for every child at a Silly Sally Party. Let Silly Sally, or one of her team, look after your entertainment needs for your special occasion. Silly Sally The Clown doesn't accept online bookings. "Just wanted to say I would HIGHLY recommend Silly Sally the clown. She entertained children solidly for the afternoon, really engaging and excellent at capturing the children’s attention. She was the HERO of the day for both the children and the adults! Would not hesitate to book Silly Sally for the next time!" "Silly sally came to our House in celbridge on sat last for our granddaughters 7th birthday . We had 10 children ranging in ages 3 to 8.silly sally was truly fantastic . The children all loved her .she has an amazing way of engaging all the children they loved her as did all the adults. I would highly recommend silly sally for children's entertainment .money truly well spent ." "Hi Brid, thanks again for the great party today. The birthday girl had a great time. She thought you were so funny. u have the patience of a saint. Thanks again." "Brid, thanks for a fabulous day yesterday. You made the party very special. The kids loved you. Rossa loves the panda he won in Pass the Parcel and went to bed with it "
"Hi Brid, Thx for doing Sophies party yesterday. She & all the kids had a ball…grt feedback. They are still talking about your underpants!! " "Hi again!! Just wanted to thank you for a fantastic service!! The children had an absolute ball!! Even the adults were entertained!! I will definitely be using you guys again and passed your details on to many of our guests! Thanks a million"
"Brid the kids had a real ball yesterday. Thanks for putting on a fun and varied show! You have changed my opinion about children’s clowns!! " "Hi Brid, a big thank u for Friday evenings party. It all got a bit hectic at he end and I didn’t get a chance to say thank u, but u were a big hit all around and Isobel had a ball. She is already talking about having u back next year. No greater complement there!! Thanx again." "Thank you so much for today, you made Kyle’s birthday. You are fantastic at what you do. You seem to really enjoy it – it shows, the kids love you…"
"Thanks so much for today. You were amazing, Isabel had a ball." * Which show are you interested in? Want 10 top tips for stress-free parties?